..(Left) Upstream part of Taguibo River just before Bobon Creek. 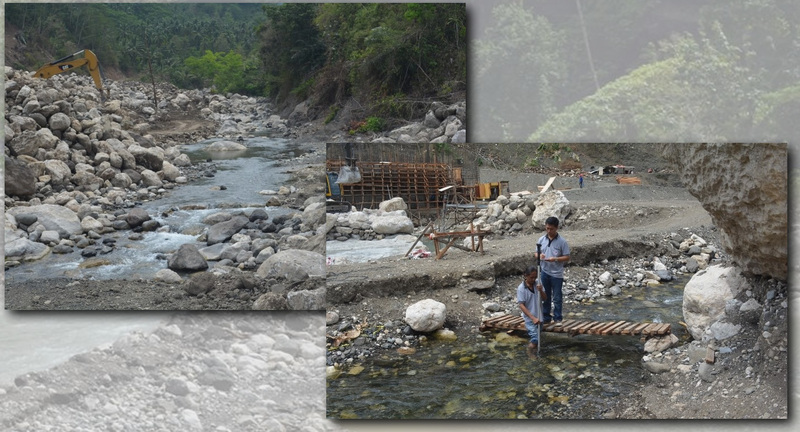 (Right) BCWD personnel measure on April 29, 2015 the water yield of the Taguibo River using a stream flow meter just downstream of Bobon Creek and within the project site of the Butuan Bulk Wa..
Forecast from the Philippine Atmospheric Geophysical and Astronomical Services Administration (PAGASA) showed that the Philippines is currently experiencing the effects of a weak El Niño. PAGASA released El Niño Advisory No. 2 last April 7, 2015 stating that the weak El Niño will likely continue until mid-2015 with the chances of strengthening toward the end of the year. On April 29, 2015, the water yield of the Taguibo River was measured using a stream flow meter. It was measured just downstream of Bobon Creek and within the project site of the Butuan Bulk Water Supply Project. The amount of water flowing through the Taguibo River measures an average of 2,100 cubic meter an hour which is about 175% of BCWD’s requirement of 1,200 cubic meters. Despite the 75% excess of water source against the requirement, the extraction rate could not reach the 1,200 cubic meters per hour requirement due to lower river depth. The average total production extracted from the Taguibo River is only 704 cubic meters per hour which is about only 59% of the requirement of BCWD with only a maximum production recorded of 886 cubic meters per hour and lowest production of 472 cubic meters per hour on that date. If the weak El Niño will extend until the end of this year, then there is a high possibility that the water yield of Taguibo River will continue to lower down until such time that it will be lower than the 59% of the required 1,200 cubic meters per hour. As part of the Butuan City Water District’s (BCWD) commitment in providing quality service to its concessionaires, the BCWD has been doubling its efforts in monitoring its water sources and preparing for any possible effects that may impede in the operation of the BCWD. BCWD relies mostly in the Taguibo River as the major source of its water supply. As such, BCWD is now preparing for any possible effect of the weak El Niño in its water supply. Among the preparations include (1) the implementation of street-by-street leak detection and repair program, (2) campaign to report any illegal water connection, (3) conditioning of the five pumping stations which are the back-up sources of BCWD, (4) guarantee that the six reservoirs are sufficiently re-charged, (5) operation of the booster pump at Km.6 Libertad to cater to high elevated areas such as Bancasi, Pinamanculan and Dumalagan, and (6) worst case scenario is the implementation of distribution management through valving and tanker rationing. Several activities are also in line to be able to inform the public on the possible effect of El Niño to the water supply of Butuan City Water District. BCWD is urging its concessionaires to conserve water. According to a study by the Philippine Institute for Development Studies (PIDS) entitled “Determination of Basic Household Requirements,” an average Filipino family uses six liters per capita per day for drinking and 12 liters for cooking and the kitchen. Majority of the water use in every Filipino household is for personal hygiene which is at 68 liters per capita per day and 74 liters for sanitation services. The basic household activities which consume the bulk of the water use of a Filipino family can be lessened through water conservation. BCWD compels its concessionaires to reduce, reuse and recycle. This will greatly help minimize the average water consumption of every concessionaire. BCWD is reminding its concessionaires that the office is only responsible for maintaining the water line from the mainline to their water meter, the concessionaires are responsible for the repairs to any part of the water system from the meter toward their homes. If they find leaks in the mainline of BCWD, they are urged to report it immediately to the office of BCWD. And if there are leaks in their homes, they need to have it repaired. For more water conservation tips to mitigate the effect of El Nino, concessionaires can visit BCWD website Homepage – www.bcwd.gov.ph. They can also get water conservation tips leaflet at the BCWD Collection Lobby.